Picture featured in the December 1968 edition of the Jesuit Bulletin. Chicago Sometimes it felt like fifty years ago. That’s only partially because sometimes the conversation would toggle back and forth to the work the Contract Buyers’ League did on Chicago’s West and South Sides decades ago from 1967 to 1972 or so, as strategies and tactics that would address the current, horrid, predatory comeback of contract-for-deed purchases were compared to the old campaign in a day long and continuing conversation between CBL veteran organizers and leaders, contemporary activists, and concerned community and clergy. 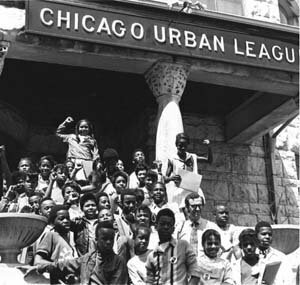 It is also because we were literally sitting among the remaining survivors of the ghettoization and depopulation of North Lawndale and Austin as we met in beautifully paneled rooms in one rectory in Lawndale and slept in the former rooms of long reassigned priests in the empty floors of another rectory in Austin managed by one priest now, where eight had once lived. Real estate manipulation, financial exploitation, and banking and institutional abandonment and racism built these 21st Century neighborhoods, even as we examined the great battles 50 years ago that were heroic without being a turning point and sat among the beautiful architectural and institutional ruins of that time. Contract-for-deed purchases are a way that a seller buys distressed property and then exploits a buyer, a family, almost invariably low-and-moderate income and too often minority, by flipping the property without making repairs while extracting predatory payments at huge premiums almost hoping for a default since there is no equity and a quick eviction process, since there was no actual property transfer, allowing the seller to sell again to another victim or another greedy seller, and keep the cycle going again. The Contract Buyers League was a campaign, spearheaded by Jack Macnamara, a former Jesuit seminarian then, who sat with us today, and a steady stream of almost eighty college students who did stints in summers and school semesters off-and-on for years as volunteers to staff the research, hit the doors, and help the members put together the weekly Wednesday meetings and constant diet of pickets, actions, and events. Around the table were some of those former students, including by old friends and comrades-in-arms from ACORN, the SEIU, and AFL-CIO Mike Gallagher from Boston and Mark Splain from the Bay Area as well as Jim Devaney, a former volunteer from Cincinnati. 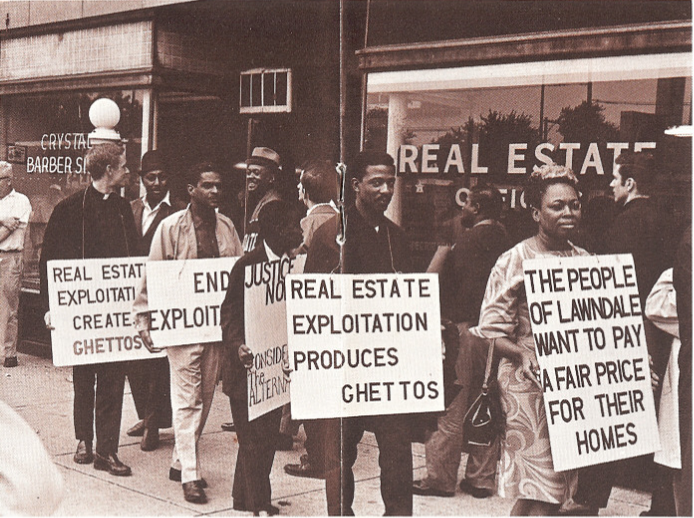 A former Black Panther from those days and other community leaders now tried to puzzle out how, with the reemergence of contract-for-deed activity now in the wake of the foreclosure crisis and home lending desert for lower income and working families, we might be able to refashion a Contract Buyers campaign that could work and win now. It goes without saying that today is different than 50 years ago. Rather than being concentrated in neighborhoods like Lawndale and Austin in Chicago and other cities with large minority populations then, today the victims are spread throughout the metropolitan area. We looked at a sample list of contract buyers acquired by two vulture hedge fund operators and there were few in Chicago itself compared to working class suburbs and developments like Homewood, Hoffman Estates, and Orland Hills. How would we get the density that put hundreds in a room on a weekly basis 50 years ago? Estimates are as high as 7 million families who are under contract-for-deed agreements now nationally, but putting them together wouldn’t be easy. We were all veteran door knockers, but we talked about how to use data files, voter lists, robo-dialers, social media, and other tools to flush out the victims and leverage the public policy and political space to create change. There’s more work to be done in coming days, but two things kept returning us to the task of today. One was hearing our new friends from these communities where we were meeting talking about how their father’s and grandmothers had bought and raised their families in contract houses. Another woman speculated that the mystery of how her sister had lost her house might have been through a contract-for-deed rip-off, and she left at the end of the day to call her and finally ask. And, then there were the stories of the actions, lawsuits, and even some victories of 50 years ago to continue to remind us that we could only really lose, if we refused to fight this plague once again.